The Saudi Aramco IPO is sure to become the biggest stock offering ever, and it is already generating tons of buzz among big banks. According to The Wall Street Journal, some of the largest financial firms in the world are scrambling for a piece of the state-owned oil behemoth. 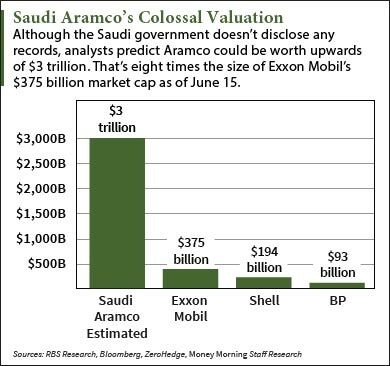 That's because Saudi Aramco is estimated to be worth up to $3 trillion. And the IPO could hand roughly $1 billion in fees to the lucky banks that underwrite the deal. Recent reports indicate two banks – one a Wall Street powerhouse and the other a small off-the-map advisory firm – will help launch this deal of a lifetime. Officially called the Saudi Arabian Oil Co., Saudi Aramco is the OPEC leader's state-owned energy company. The Saudi government announced in January it was considering an initial public offering of up to 5% of the company. Two months ago, Prince Mohammad bin Salman announced the deal will occur in 2017. Since Prince Salman confirmed the deal, analysts have speculated on the Saudi Aramco valuation. Bloomberg and RBS Research place the firm's valuation somewhere between $2 trillion and $3 trillion. That eclipses the combined valuation of all seven Big Oil corporations. You see, Saudi Aramco has ruled the global oil market for 70 years by producing more than 10% of the world's daily supply. The company sits on a colossal 311.10 billion barrels worth of oil reserves. That's 8.5 times larger than the combined reserves of Exxon Mobil Corp. (NYSE: XOM) and Royal Dutch Shell Plc. (NYSE ADR: RDS.A). All of this means the Saudi Aramco IPO will likely raise at least $100 billion in proceeds if the government sells even 5% of the company. Since IPO dealmakers typically make between 10% and 40% of the total proceeds in fees, the investment banks issuing the stock could rake in at least $1 billion on one deal. The two investment banks so far directly working on the IPO are JPMorgan Chase & Co. (NYSE: JPM) and M. Klein & Co. According to The New York Times, JPMorgan Chase has had a working relationship with the Saudi Arabian government for decades. The bank was the only adviser on Saudi Arabian Mining Co.'s $2.5 billion offering back in 2008. It also helped Aramco secure a $10 billion international loan last year. Not to mention the bank has generally been the most profitable bank on Wall Street. Financial research firm Data Coalition reported JPMorgan Chase posted revenue of $22.7 billion last year – more than any other U.S.-based investment bank. The more obscure choice for help on the Saudi Aramco IPO is M. Klein & Co.
M. Klein & Co. was founded by former Citigroup Inc. (NYSE: C) executive Michael Klein. The 52-year-old banker is known for advising several of the biggest mergers in recent years, including last year's $130 billion merger of DuPont Co. (NYSE: DD) and Dow Chemical Co. (NYSE: DOW). He also helped IHS Inc. (NYSE: IHS) acquire Markit Ltd. (Nasdaq: MRKT) for $13 billion in March. Although his new smaller bank mainly focuses on transactions, Klein was brought in by Aramco to help with the offering. He's seen by the Saudi government as an independent voice capable of navigating the high-profile IPO process. Stay tuned to Money Morning as the Saudi Aramco IPO date approaches. Follow us on Twitter and like us on Facebook for the biggest IPO news.